I just wanted to point out a deal that I got at Home Depot yesterday. 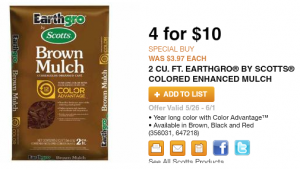 I went to buy 20 bags of the EarthGro Mulch which is on sale for $2.50 each through tomorrow, 6/1. Well, they were all out of the Earthgro Brown Mulch and only had the Scotts NatureScape which is priced at $4.97 per bag. Way to expensive when you need a bunch of bags. So, I decided, why not ask to see if they would honor the EarthGro price for the NatureScape. And, without a hesitation, they certainly did. I only had to pay $2.50 for the higher priced NatureScape. So, if something is on sale at Home Depot and they are out of stock, be sure to ask if they will honor the price of the sale item on another brand. I saved myself $50 on that. That is what I call great customer service.